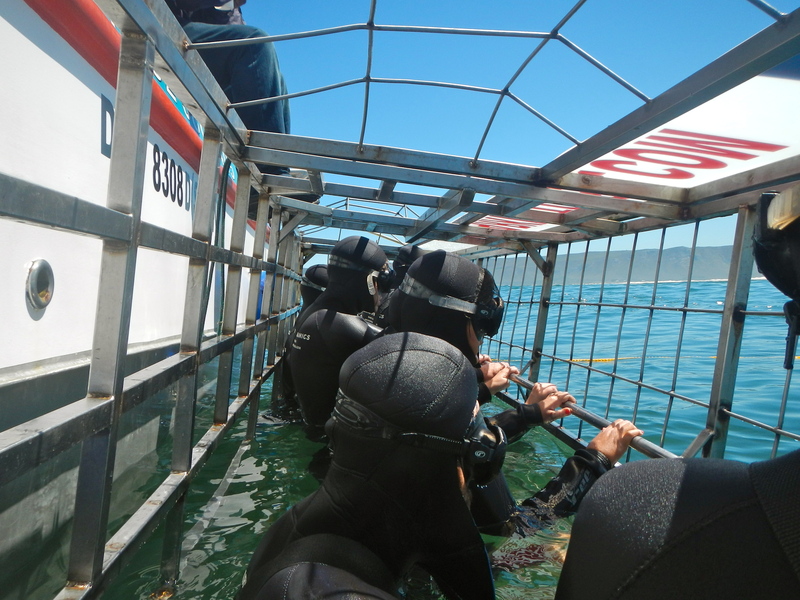 Although our Shark Cage Diving experience was exciting, it was not exactly a romantic start to our South African vacation. 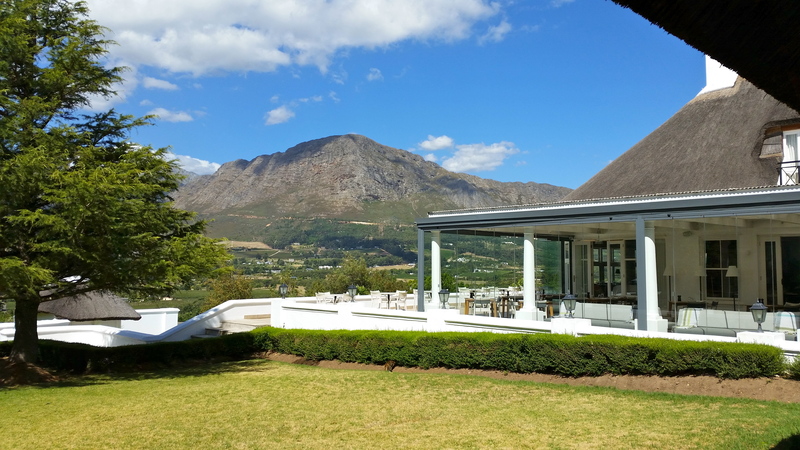 Luckily, my sweet hubby had planned a picture perfect part two: several days in the Franschhoek wine region, a foodie haven with spectacular scenery and world-class wines. 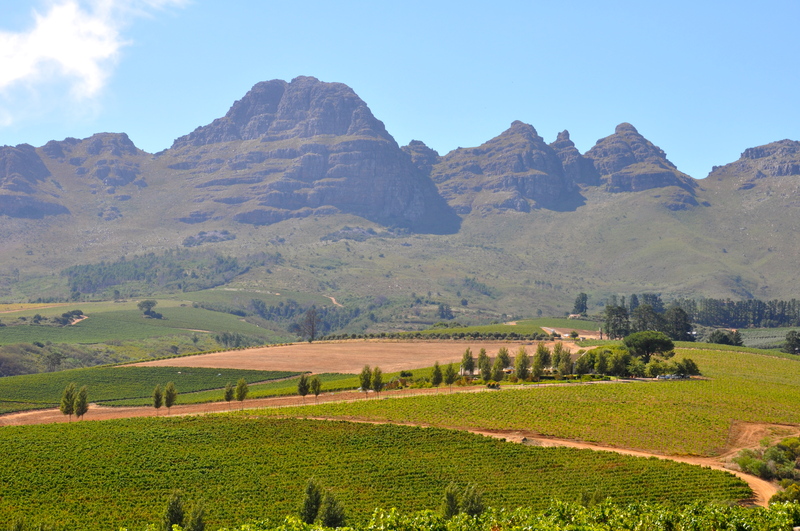 The drive from Cape Town was only a little over an hour, but it was filled with lovely views of vineyards and beautiful mountains. 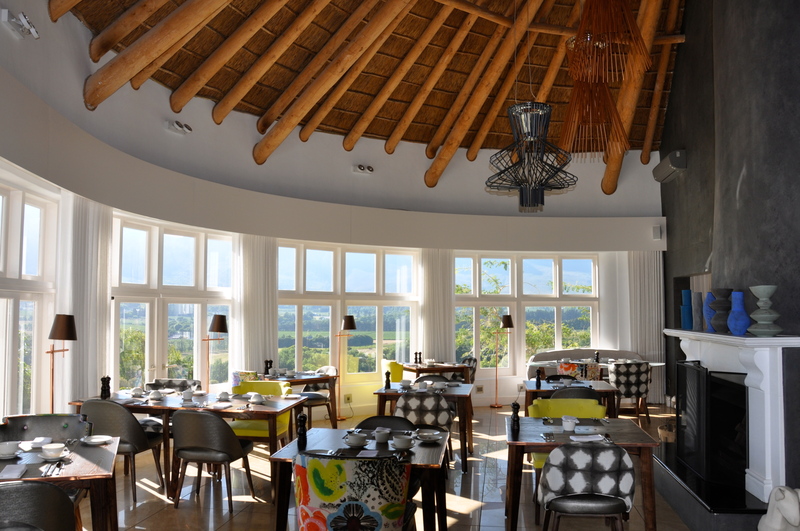 We arrived at our hotel, Mont Rochelle, which Sir Richard Branson had recently acquired and completely refurbished. Cool grays, bright pops of color, and modern lines dominate the decor. Everything seems very well thought out, as many of the newer “design hotels” are, but Sir Richard also threw in some whimsical pieces: chairs covered in artificial grass and strange yellow bowls that resembled large empty tennis balls. The two resident cats also lend a homey touch. Lovely views all around. This was where we ate breakfast each morning. Grass chairs? But, of course! Not a bad view to wake up to! Our first night, we enjoyed the restaurant at the hotel and settled into the relaxing atmosphere. 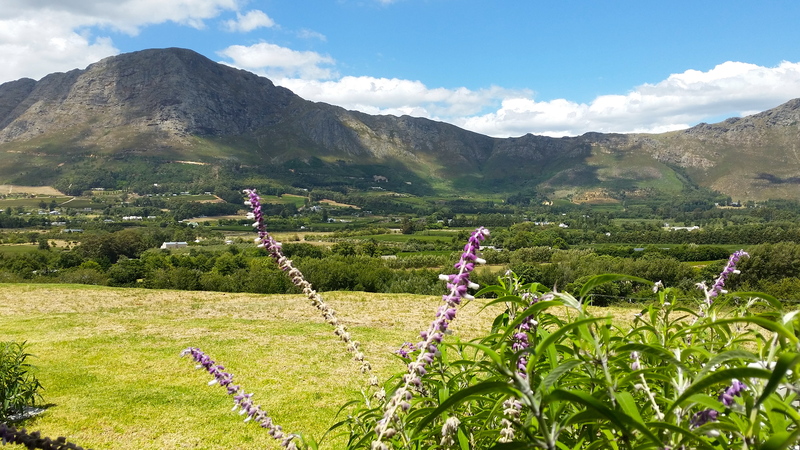 The next morning, we had a full day wine tour planned of the Franschhoek/Stellenbosh Wine Regions, or at least a very small portion of it. 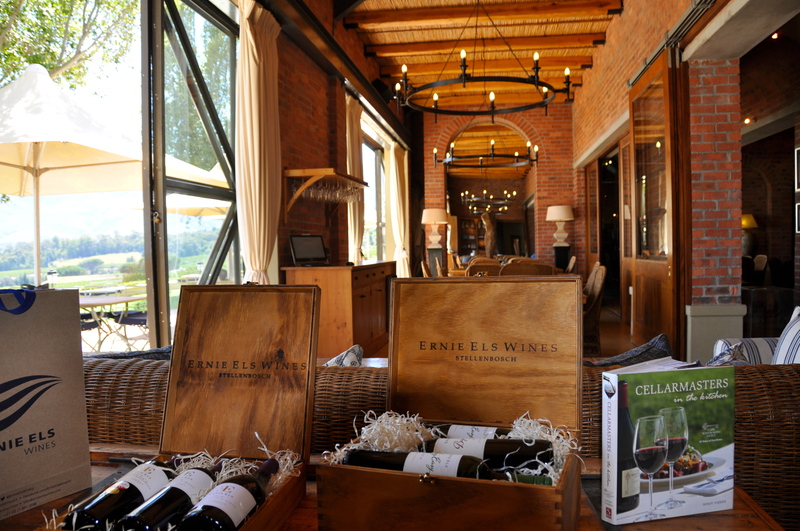 This wine area is enormous, with close to 300 wineries. There was no way we could see them all and live to tell about it! We learned the hard way on previous trips to Napa that trying to tackle more than three or four wineries in a day just makes you silly drunk and unable to taste much of anything. Not starting out with a long list of must-see wineries made it much easier, as the pressure was off to rush about from place to place. We left the choices up to our driver, and he picked three very nice spots based on our favorite types of wine. Of course there was a putting green! 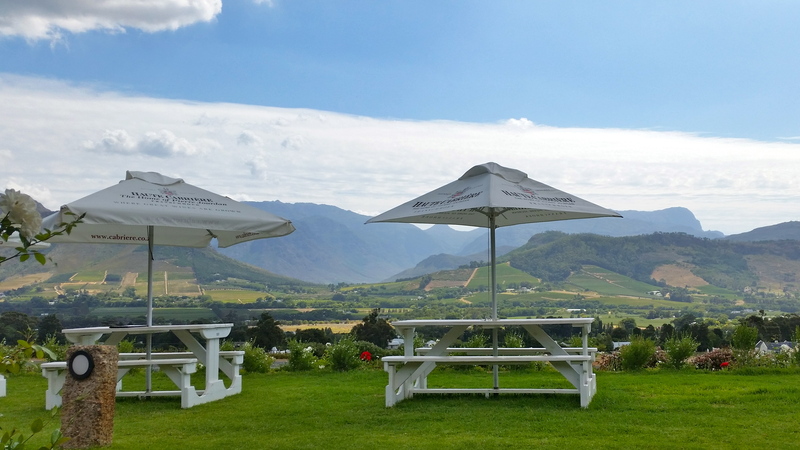 Next, we visited Neethlingshof, to sample their excellent pinotage, a uniquely South African blend of hermitage and pinot noir grapes. 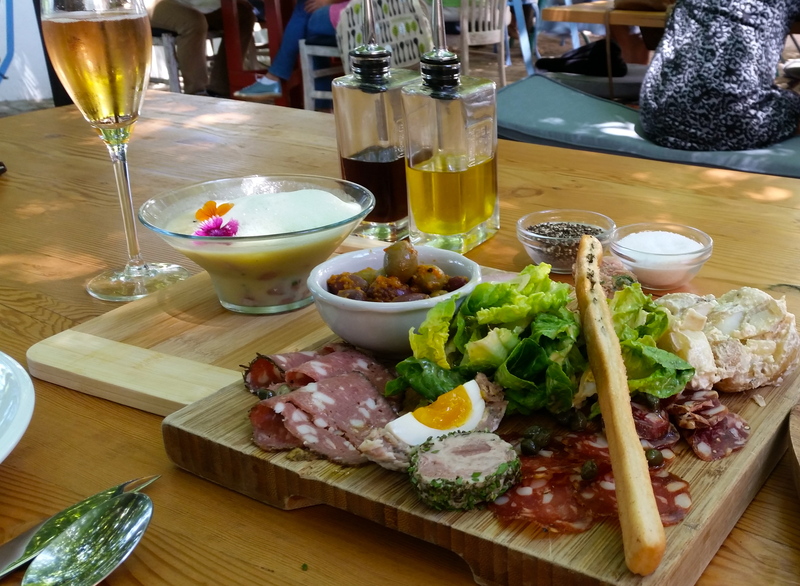 We stopped for lunch at the lovely Bread & Wine restaurant at Moreson Winery, and nibbled on their recommended charcuterie platter. 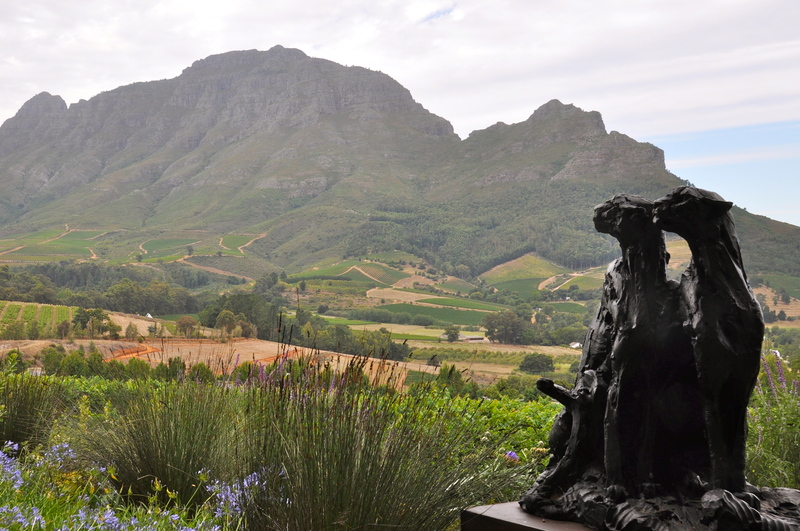 Our last stop for the day was at La Motte, and then we were done. Even with pouring out much of what we were served, we had had enough wine for the day. Slow and steady wins the race, and we had several more days of this ahead of us. 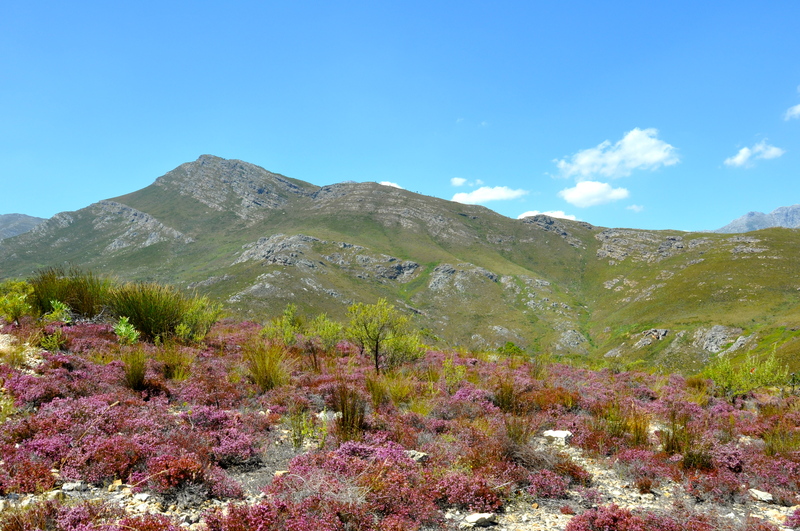 The next day we began with a lovely drive just outside of Franschhoek, where we discovered near wilderness. This seems to be the main difference between this wine region and others we have visited. Its vastness and relative sparse crowds give the impression that you have the place to yourself. So relaxing. 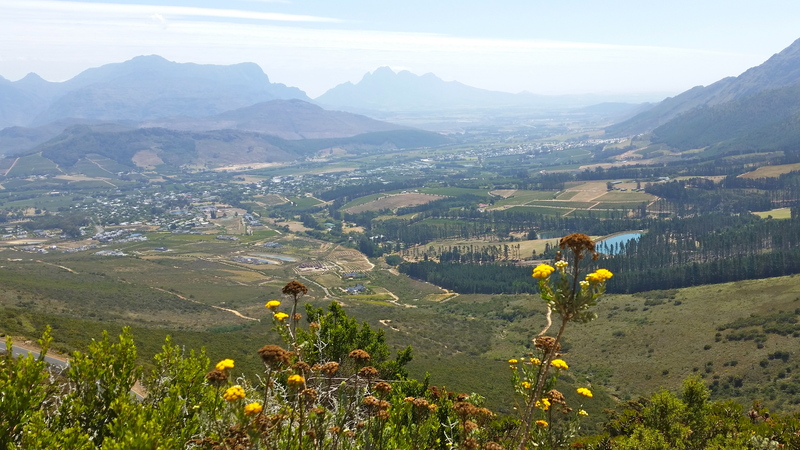 Looking down at Franschhoek from the pass. Wide open spaces just outside of town. 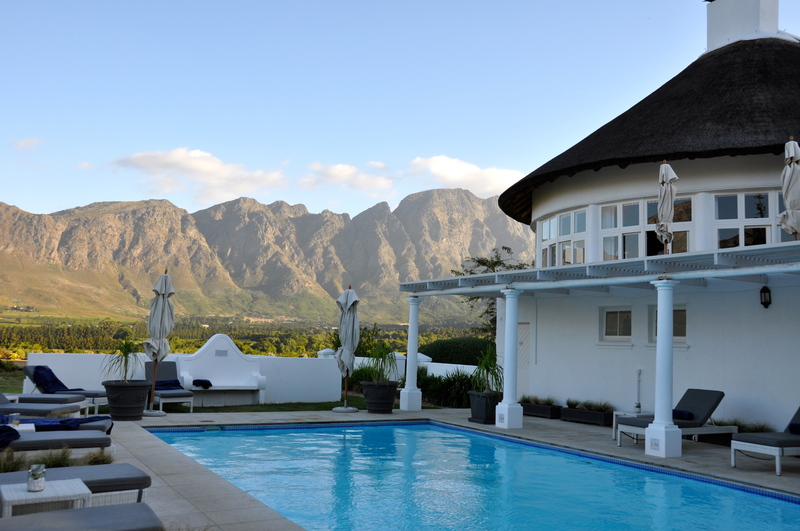 After our short drive, we headed towards Stellenbosch to see a couple of places we had missed. Visiting Haute Caubriere, were we tasted an un-oaked Pinot Noir, a lovely mix between a white and a red wine. Not a rose, but something entirely new. 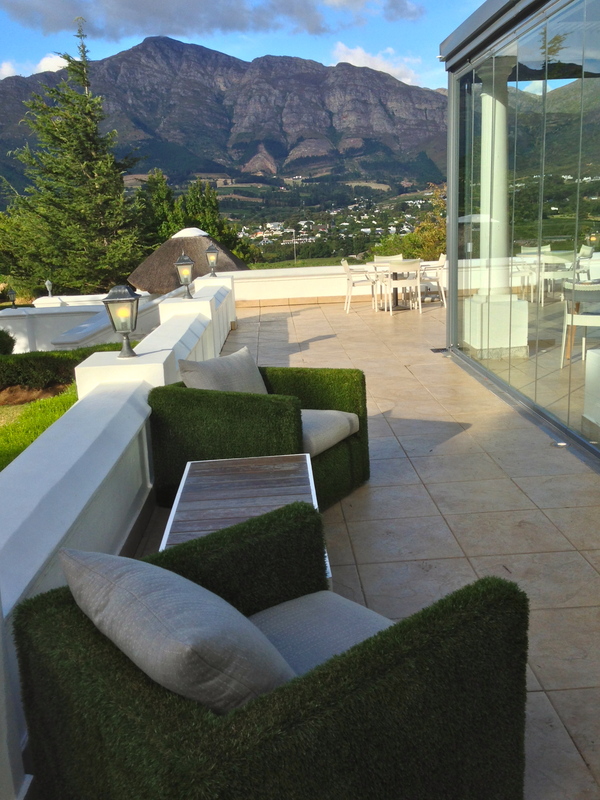 Visiting Delaire Graff, a very posh hotel and winery with a spectacular view. Dinner that night was a Le Bon Vivant, a small french restaurant in town. 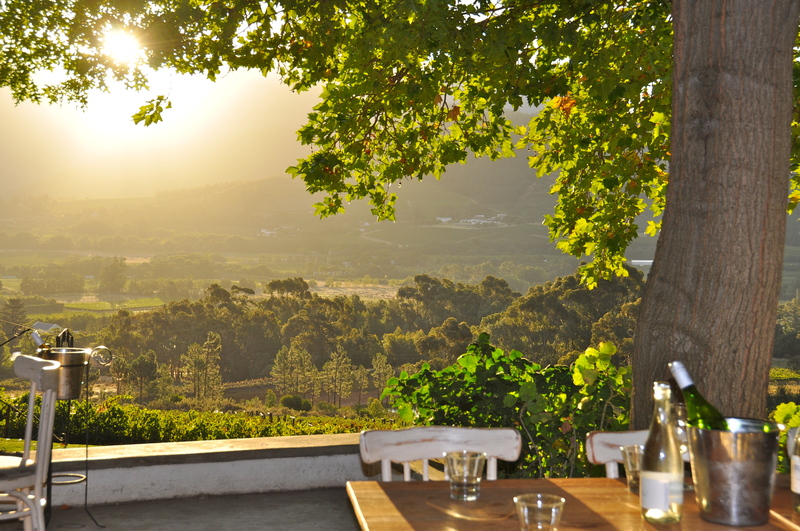 Franschhoek (which is dutch for “French corner”) was settled by French huguenots in the 1600’s. Their influence is still strongly felt in many ways, not least of which is the predominance of excellent French restaurants in the area. The next day we hopped aboard the “Wine Tram”, a slightly hokey, but fun way to see more great wineries without having to drive under the influence. We enjoyed the experience and were able to try even more wine, even though we were both reaching our limits. 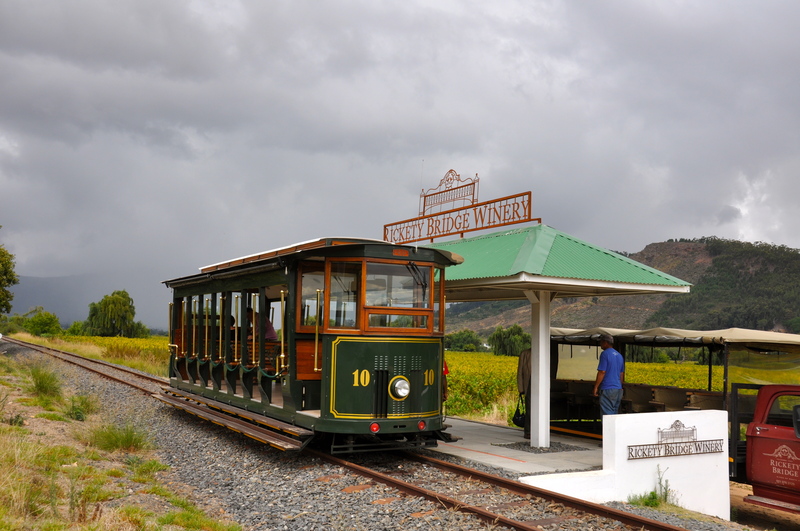 The Wine Tram. All aboard! Toot! Toot! Since this was our final night, we had saved the best restaurant for last. La Petite Ferme is a very popular spot, but usually only open for lunch. 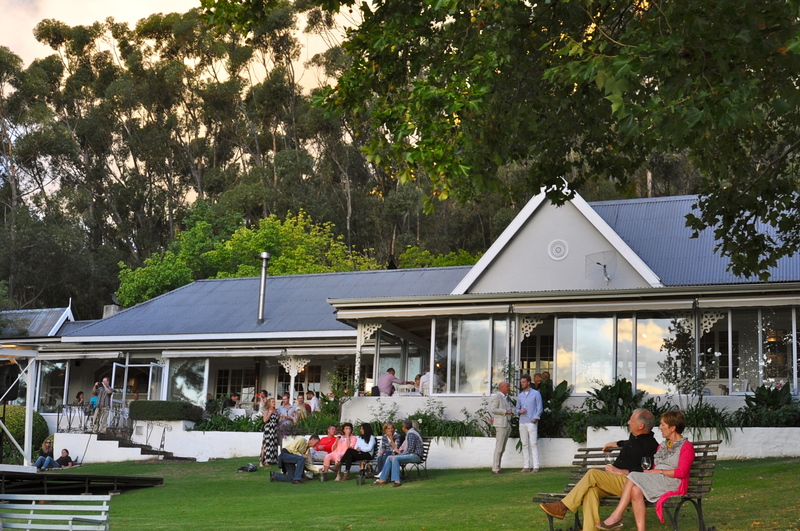 But on Friday nights it is open for dinner and live music is played on the lawn overlooking the vineyard. We had called several weeks before the trip and made a reservation for 7:00 pm. We arrive on time only to have a very surly hostess inform us that we did not have a reservation, but she did find our name on a waiting list. The place was completely booked, especially the outside tables overlooking the jazz band. What to do? I’ve found the best tactic is to smile sweetly and stand your ground until someone finds a solution. We were not leaving, so they needed to figure out where to put us. The surly hostess placed us at a table in the back near the kitchen. It was’t exactly what we had in mind, but at least we would be able to have a nice meal. Then, our darling waitress saved the day. She sat up a table outside in what is normally the bar area. 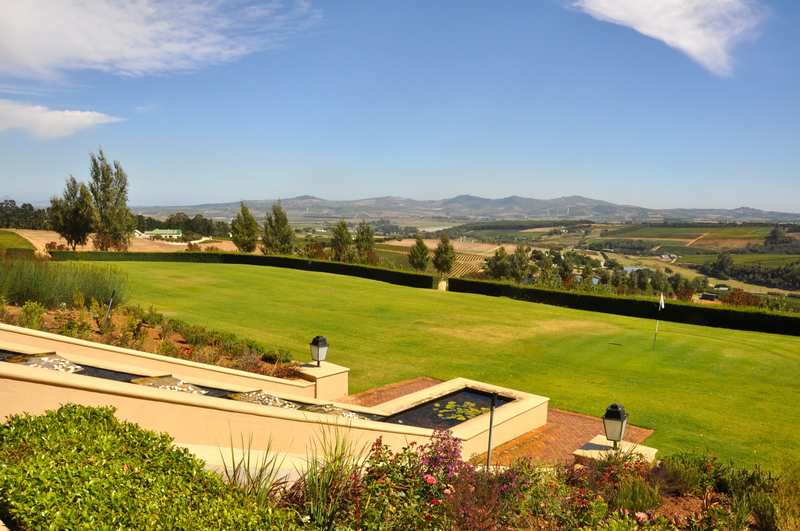 It had a perfect view of the band and vineyards and we felt very special. See, there are angels among us. We had the best spot in the house. An excellent band played all kinds of music. After the sun went down, we danced under the stars. 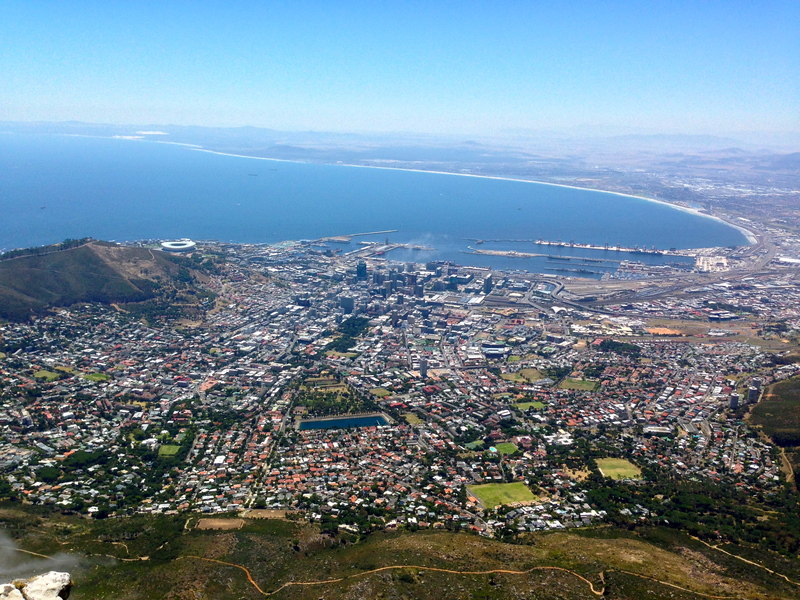 It was a wonderful week in South Africa and we cannot wait to return. Having only scratched the surface of what this beautiful country has to offer, we look forward to finding new treasures on our next trip. As long as my husband doesn’t announce a lifelong desire to go bungee jumping or hang-gliding, our future trips are sure to be romantic from start to finish! Sharks have never been my favorite sea life, even though I am a scuba diver from way back. I won’t say how far back, but my original certification documents were lost in a fire at the PADI office sometime in the 1980’s. They were kept on microfilm, you see. All of this is to illustrate that I am generally very comfortable in and under the water. My selective fear of sharks is a result of my very first open-water dive in Cozumel, Mexico, so may moons ago. There I was, a newbie diver, trying to juggle fifty-plus pounds of bulky equipment and perform a perfect “giant-stride” entry off of the boat. Yeah, right. Grace was not my strong suit then, and it still isn’t. Instead, I splashed into the water with all of the finesse of a watermelon falling from a two story building. Mask askew and completely disoriented, I took a moment to get myself organized. When the bubbles cleared and I took my first breath of cold, compressed air, the first thing I saw were two shadowy figures about 50 feet away. Yes, they were sharks, and I was certain I was going to die. Obviously, that did not happen. Duh. Instead, the two sharks simply turned and swam away, and I was left with a permanent fear of those sleek, gray killing machines. Well, maybe that is a little overdramatic, but I really, really don’t like sharks. 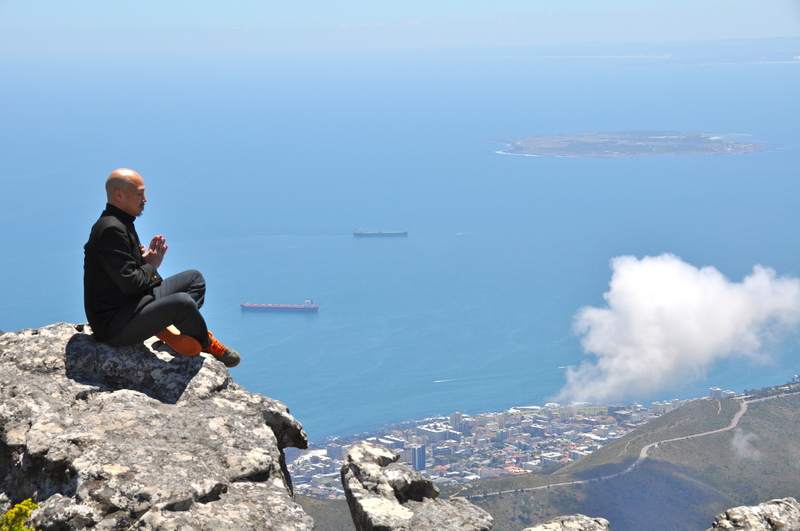 Apparently, I need to speak up more forcefully about my deepest fears, because what did my husband sign us up for on a romantic trip to Cape Town, South Africa? Yes, Shark Cage Diving. Just take me out back and shoot me. But I’m a big girl and no hissy fits ensued. 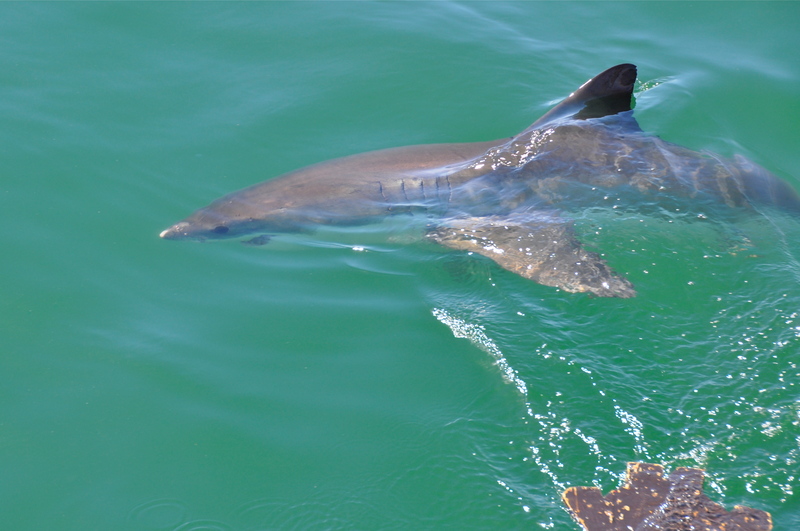 However, I did start praying for bad weather, a broken down boat, a sudden onset of fever – anything to avoid getting into the freezing cold South African water where you are guaranteed there will be sharks. Keep in mind, these are not little sissy sharks, we would be in the water with Great Whites. They make movies about such beasts. Oh, and by the way, I really, really don’t like cold water either. 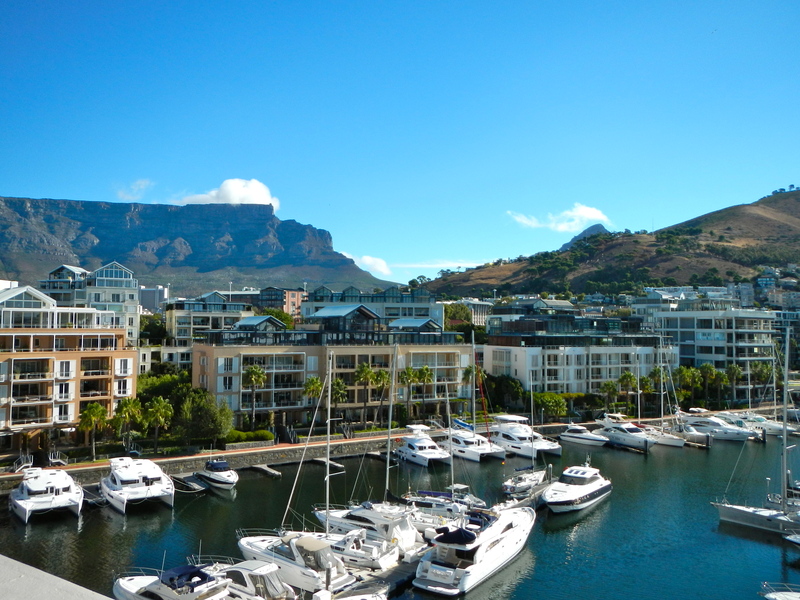 The day came for our trip and we arrived in Cape Town to beautiful weather. Darn it. We were scheduled to go diving early the next morning. My husband in his wisdom had planned it early in the trip, bless him, so we could get it over with and then enjoy our vacation. Upon arrival to our hotel, the concierge told us our dive had been cancelled due to a very windy forecast for the next day. Oh, joy! I tried hard not to break out in a happy dance. Then she said they had rescheduled it for the following day, which was forecasted to be perfect weather. Crap. Now I had another twenty-four hours to fret. 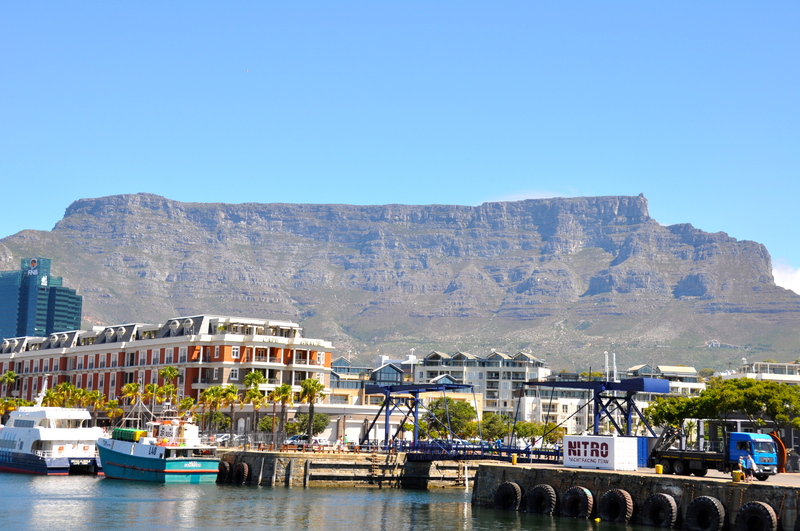 Beautiful Table Mountain with a view of our hotel, the Cape Grace. 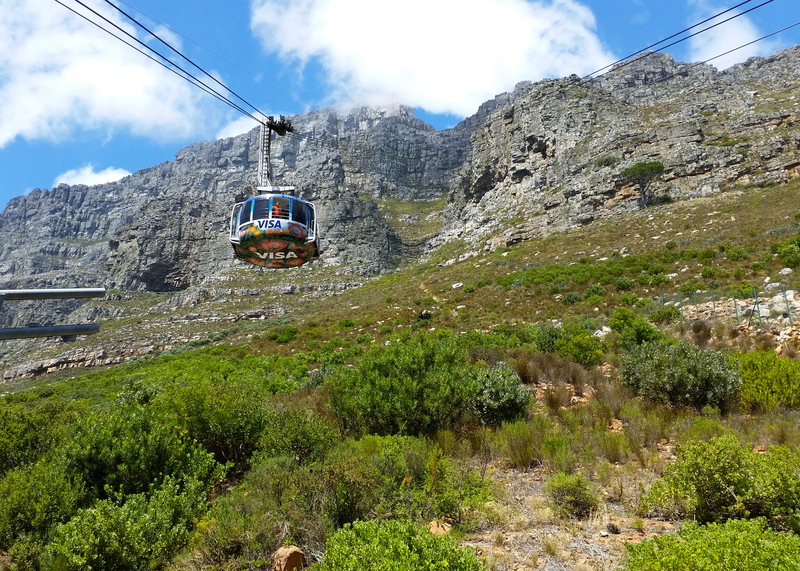 The tram to the top of Table Mountain. The floor rotates so everyone has a great view on the way up! 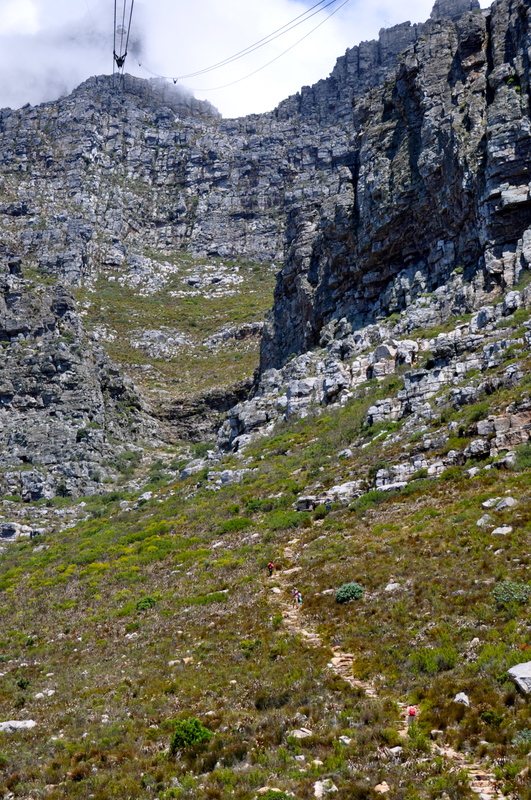 There is a trail to the top for those people with excessive amounts of time and energy. One of a very interesting group of characters. 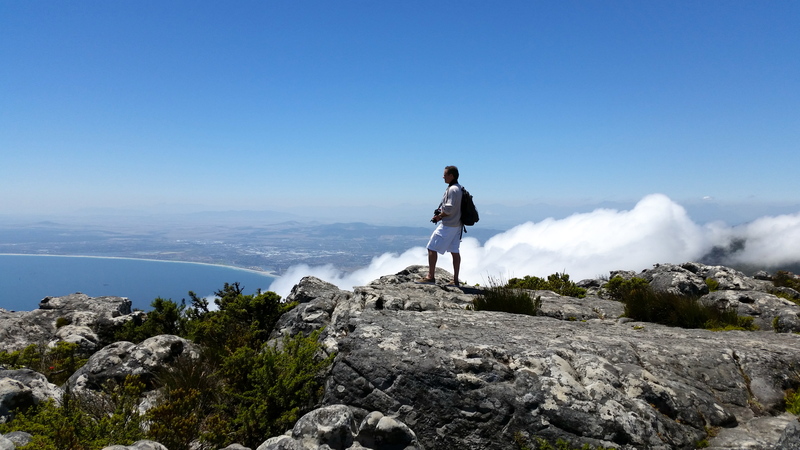 My hubby, the King of the Hill. The next morning, my prayers went unanswered as we awoke to a clear, calm day. Hubby made it clear that Shark Cage Diving had always been very high on his bucket list, so I finally decided to fake a smile and go along. This act was not entirely altruistic, I must admit. I’m still hoping for diamonds as a reward. We were picked up at our hotel along with a group of four quite rotund British tourists, two women and two men. I don’t say this to be in any way derogatory, but I was certain that the tour company would not have wet suits large enough to fit either of the men. Already waiting in the van, was a very quiet Indian couple, who had planned this excursion for the wife’s birthday. She seemed particularly excited and he, well, looked about as excited as I was. 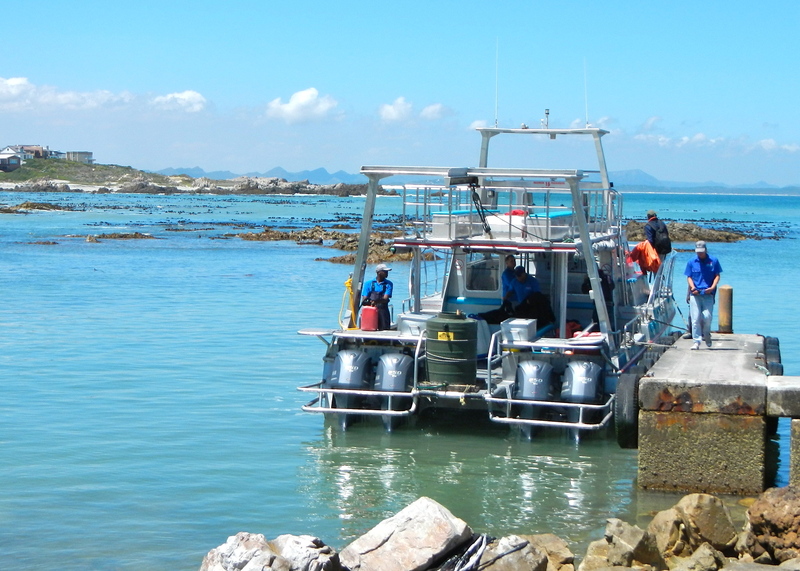 It was a two hour drive to where the boat would be picking us up in Gansbaai. Along the way, we learned that only one of the British men was planning to dive. The rest of the group was only along to take pictures. I breathed a sigh of relief to know that we would not be crammed into a cage with them, lovely and friendly as they were. When we arrived at the pick up spot, it became clear that the number of people on the boat was going to far exceed the people in our little van. No less that forty people were gathering to board. They served us a small breakfast, and showed a short introductory film about the dive. Then, they sized us up individually for our wet suits, masks and booties. While we were waiting our turn for sizing, I overheard our Indian friend ask one of the workers if they had any motion sickness medicine, which of course they did not. Uh-oh, with my luck, he will definitely be in the cage with us. Attaching the cage to the boat. Who’s first, we all wondered. The crew began calling out names, handing out our wet suits and putting us into groups. Luckily, we were not in the first batch. I needed to see if they survived before I stuck my tootsies into that water. 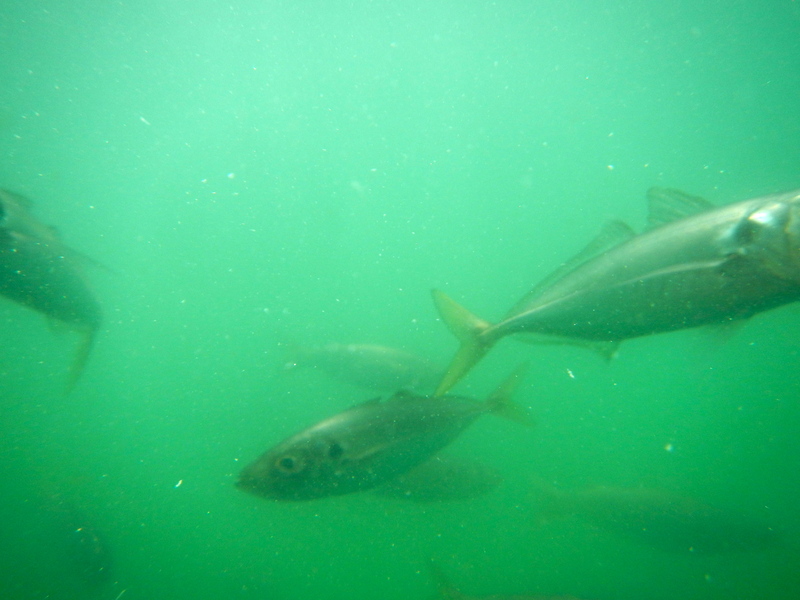 As the first group entered the cage, the crew tossed a batch of dead fish tied to the end of a rope into the water. They also had a wooden form that supposedly looked like a small seal, at least to a shark. 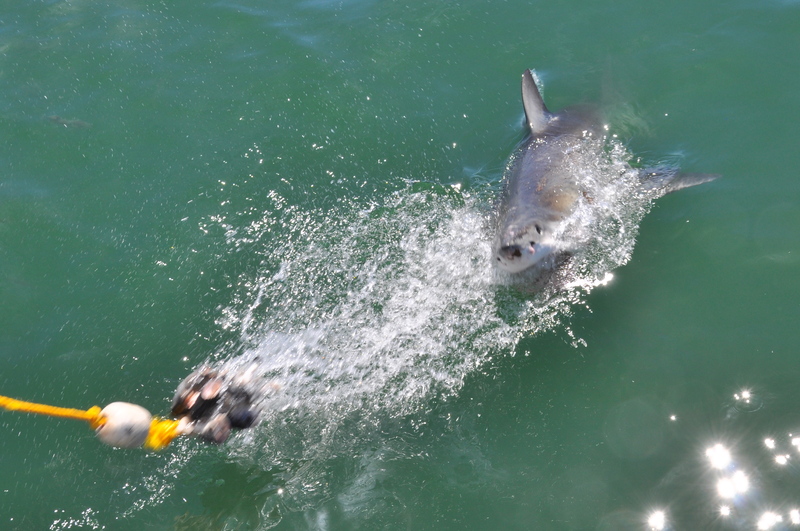 Within minutes, the first sharks arrived as the crew taunted them with the fish-on-a-rope. 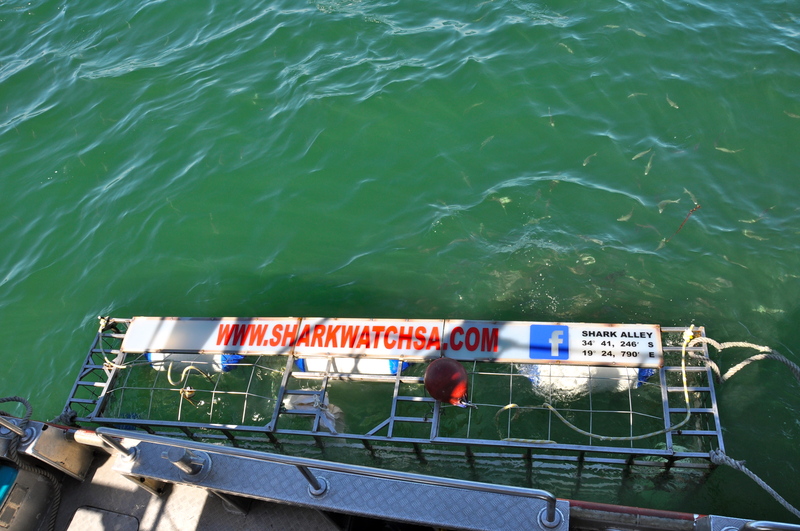 As the sharks got close to the fish, the crew yanked it away, in an effort to draw the sharks closer to the cage. Each time, as the shark got close to the cage, the crew yelled “Down, left!” or “Down, right!” so the people in the cage could go underwater to see the sharks up close. This was all very exciting to watch from above, as we could see what was coming and doubted the people in the cage had any idea. Finally, it was our turn to enter the cage. We wriggled into our wet-suits and took the plunge. The water, although quite cold, actually felt refreshing after the effort of cramming my sweaty body into a too-tight suit. As predicted, immediately to my left was my green-around-the-gills Indian friend and his wife, grinning with glee. 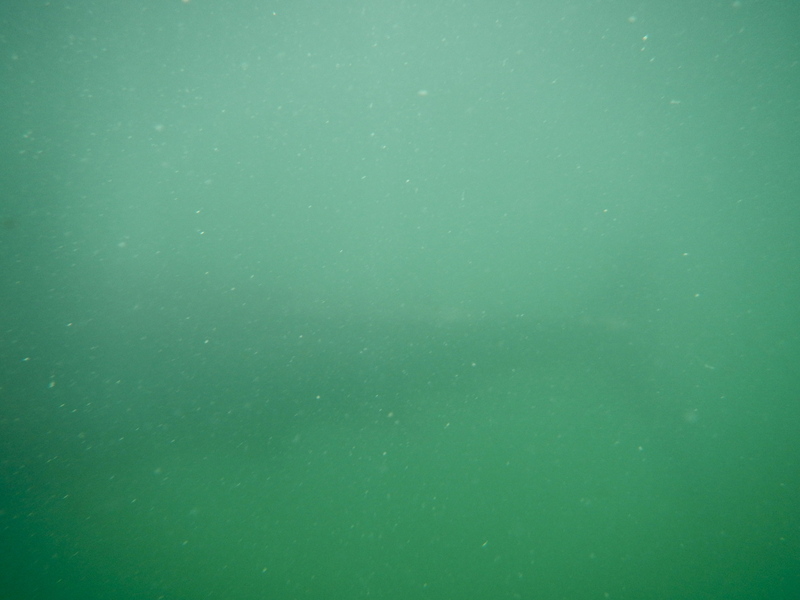 The only thing visible in the murky water were the small bait fish attracted by the chum in the water. If you squint and look closely, you can make out the shape of the back end of a shark. Not exactly a National Geographic worthy photo, but proof nonetheless.. The entire twenty or thirty minutes we were in the cage, our Indian friend shivered so violently that it was actually shaking the cage, all the while saying, “C-c-cold, I’m so c-c-cold.” Poor guy, I don’t think he got much out of the experience. His wife was freezing as well. She asked to be let out of the cage early when it became clear that the best views were above the water anyway. When our time was up, we all climbed out of the cage and the next group climbed in behind us. 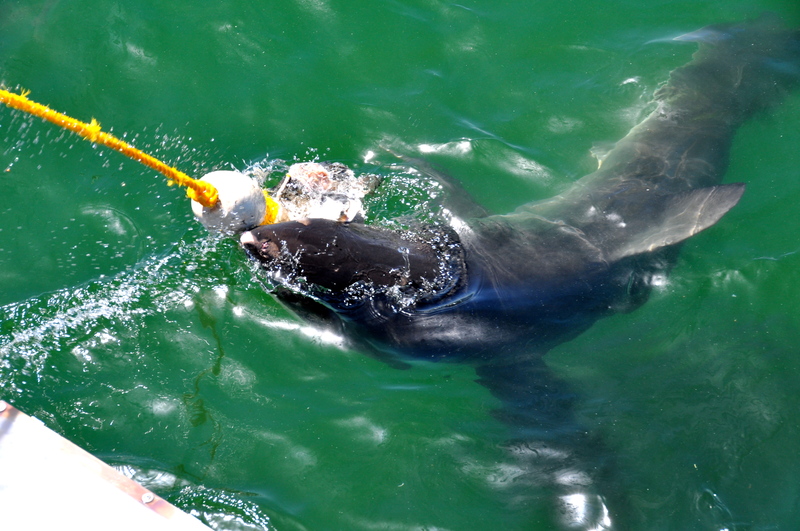 Immediately after they closed the cage, a huge and very fast shark managed to grab the fish-on-a-rope. 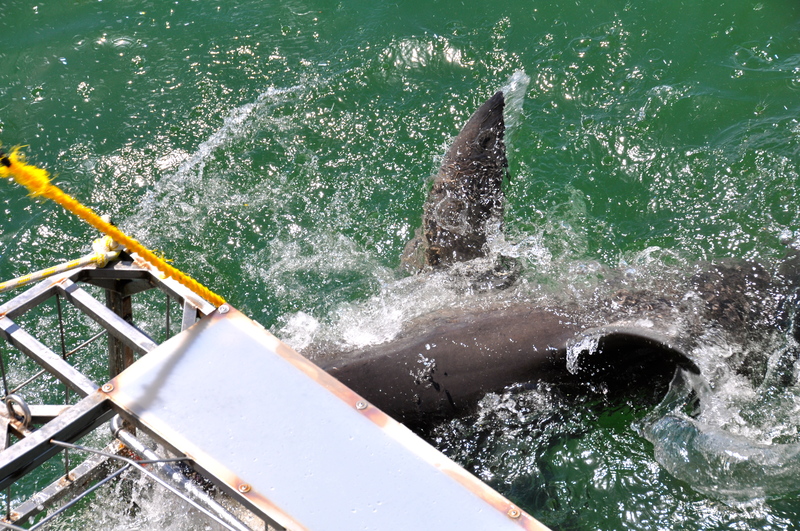 A vicious tug-of-war ensued, as the shark thrashed and spun about, slamming into the cage. This group got a little more excitement than we did, which was A-OK with me! There were several more groups to follow. At one point, I looked down to see our very large British friend taking his turn in the cage. Unfortunately for his fellow cage-members, he was doing his own version of chumming the water. Enough said about that, but I was hugely thankful that I was not in there with him. All in all, it was a fun and very interesting day and not as scary as I expected. Despite all of my fretting about sharks and cold water, the scariest thing about the whole experience was knowing that if I ever were fool enough to go swimming in that freezing water again, there would be no way to see a shark coming. That and the prospect of the crew pouring chum directly onto the people in the cage, which does happen occasionally, I’m told. When we got back to shore, they previewed a short video that one of the crew had made during our trip. I had not noticed him filming, the sneaky guy. Of course, we bought a copy so we can relive our day, especially if we ever need a reminder NOT to go swimming while in South Africa.